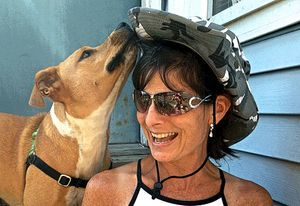 Seattle based professional dog trainer and dog walker Deborah Gabbert is committed to helping dogs and their humans live the best possible life together. Using up-to-date, science-based, dog-friendly methods, she promotes understanding, respectful communication, and playful cooperation between dogs and people, all while enjoying a whole lot of fun. Deborah began walking with dogs for a local company in 2011, and in 2013 launched her own professional dog walking business, Rex-Treks. She was fortunate enough to be invited to participate in a canine educator apprenticeship with Judi Anderson-Wright of Great Dog in 2013, and has since earned a credential as a Certified Professional Dog Trainer from the Certification Council for Professional Dog Trainers (CCPDT). Deborah is continually developing herself in the art and science of training dogs so that she can offer effective, fun and creative approaches for teaching people and training dogs. Most recently she completed a PRO Dog Trainer certification with Absolute Dogs based in the United Kingdom. The Absolute Dogs approach is an innovative game-based learning that helps dogs develop concepts for life such as confidence, optimism, impulse control, thinking in arousal and other imminently practical capacities for succeeding in the human world. Deborah is a member of the Association of Professional Dog Trainers (APDT) and an instructor/examiner for Project Canine, a locally grown therapy dog education and outreach nonprofit. Deborah and her canine partner, Macy, are also a certified therapy dog team with Project Canine. You will likely see Macy hanging out in classes to help demonstrate skills and facilitate lessons in canine social skills. And for the treats and fun, too of course – WOOF!